Lance Naik Kuldeep Singh hailed from Punjab and was enrolled into Indian Army’s Sikh Regiment. 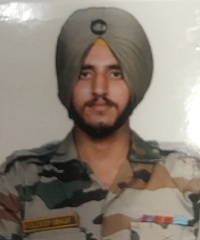 During 2017, Lance Naik Kuldeep Singh’s unit was deployed along the LOC in Keri sector in Kupwara district of J & K. The LOC in that sector is very volatile and active where the enemy often resorts to unprovoked firing. It is monitored and guarded by the security forces by employing armed patrols on a continuous basis. On 23rd December 2017, around noon time, the Pakistani forces indulged in ceasefire violation and resorted to unprovoked firing. During that time an armed patrol of the Sikh Regiment led by Major Praful was on a regular patrol of the area. At around 1215 hours Pakistani troops who were hiding at Brat Galla in Keri sector targeted the army patrol team. The heavy firing was accompanied by the artillery fire from across the border indicating that it was a pre-planned dastardly attack. 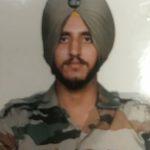 The patrol team leader Maj Praful Moharkar and three of his troops Lance Naik Gurmail Singh, Lance Naik Kuldeep Singh and Sep Pargat Singh took direct hits and got seriously wounded. They later succumbed to their injuries and laid down their lives in the service of the nation. A salute of Real Hero ” Sardaar Kuldeep Singh.